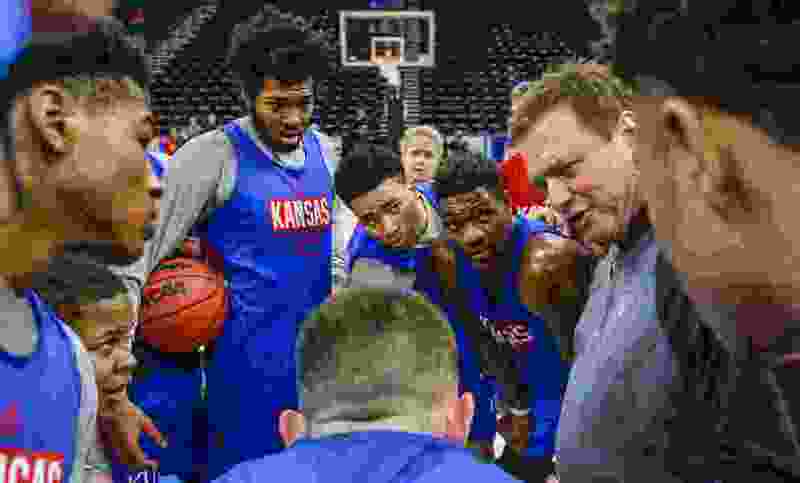 Leah Hogsten | The Salt Lake Tribune Kansas Jayhawks head coach Bill Self talks with players during practice on Wednesday at Vivint Smart Home Arena, prior to their round one game against the Northeastern Huskies on Thursday at the 2019 NCAA Division I Men's Basketball Championship, March 20, 2019. Tipoff • Thursday, 2 p.m.
About the Huskies • They won the Colonial Athletic Association title for the second time in five seasons last week with an 82-74 win over Hofstra and are making their ninth appearance in the NCAA Tournament. … Their leading scorer is 6-foot-5 guard Vasa Pusica, a native of Serbia who began his college career at San Diego of the WCC. Pusica became the 38th player in school history to surpass 1,000 career points and currently has 1,054. … G Jordan Roland has made 97 3-pointers and needs one more to break the school record for 3’s in a single season. Roland averages 14.7 points per game. ... Junior G Shawn Occeus of Boynton Beach, Fla., said his favorite NCAA Tournament memory growing up was watching former BYU guard Jimmer Fredette’s run to the Sweet 16 in 2011. About the Jayhawks • They are making their 48th NCAA Tournament appearance and are 107-46 in the event. This is their 30th consecutive appearance in the Big Dance, an ongoing NCAA record. … They have advanced to the Sweet 16 31 times, the Final Four 15 times and the national championship game five times, winning three. … Junior forward Dedric Lawson leads them in scoring with a 19.1 average and in rebounding with a 10.3 average. … Lawson and freshman guard Devon Dotson made the Big 12 championships all-tournament team. Dotson averages 12.1 points and 3.6 assists. … This is their first NCAA Tournament appearance in the state of Utah and they have won 12 straight first-round round games.